We’ve become accustomed to thinking of jazz as delicate sounds played by iconic wise men (and women) in museum-like settings. But during its salad days, jazz was played as dance music in dance clubs. 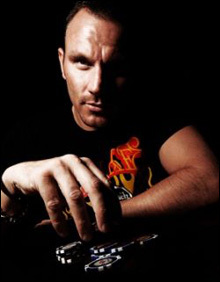 In that spirit, British DJ Mark Knight, perhaps the most talked-about new name in house production, played a three-hour set at Underbar last Thursday whose spectacular improvisations emphasized both the rhythm of his music and the ecstasy of dancing to it. Knight lives in Maidstone, Kent, and he’s a working-class kid — his parents, he says, were authentic cockney — who thinks of his tracks as “a get-out-of-jail card, something so irresistible that whenever a DJ gets in trouble in a set he can just cue up my track and all’s well.” His Underbar set proved he has the keys to free people from every sort of imprisonment.